Let’s Celebrate! Royal FloraHolland has announced the finalists of the Dutch Tulip Award (formerly the Glazen Tulp Award) 2018/19. Every year growers and breeders introduce hundreds of new cultivars and concepts. The Award goes to the most successful market introduction and is divided into the categories: cut flowers, houseplants, garden plants and concepts. Wildcard. 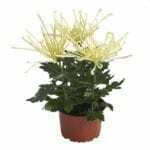 We can proudly announce that in the category ‘indoor plants’ a wildcard for the final has been distributed to our pot plant Chrysanthemum Fireworks ™. 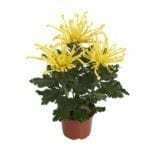 Fireworks ™ is a unique spider-shaped pot chrysanthemum that owes its name to the very beautifully curled petals. A great honor, which gives this special houseplant just that extra attention that it deserves! Fireworks ™. This eye-catcher is suitable for both inside and outside on the terrace, patio or balcony. Thanks to the long-term flowering, the consumer has a long time to enjoye this large-flowered pot chrysanthemum. Fireworks ™ is grown by Lionplant and is available in the colors yellow and cream in various packaging and themes. Presentation. On 10 January 2019 the winners will be announced during the presentation of the Dutch Tulip Award.